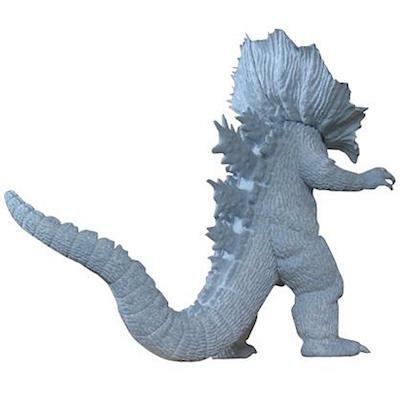 BILLIKEN REAL MODEL KIT SERIES: "JIRASS"
ULTRAMAN's Moonlighting Godzilla in Soft Vinyl! Billiken's first Real Model Kit addition in two years: Jirass! For more than three decades, the world famous vinyl kit maker, and vintage toy shop, Billiken Shokai, has produced an endless number of high-end figures, tin toys, and affordable vinyl kits, including a huge parade of monsters — both east and west — ranging from Beulah (It Conquered the World) to Lon Chaney's Erik (Phantom of the Opera). Not to mention a swarm of Godzillas and an army of creatures from Toho's kaiju eiga and the Ultraman pantheon. A face only a mother... Incredible attention to detail, in vinyl! Jirass is the latest in Billiken's long-running and highly-lauded "Real Model Kit" series, sculpted by master Kiyotaka Sugo. 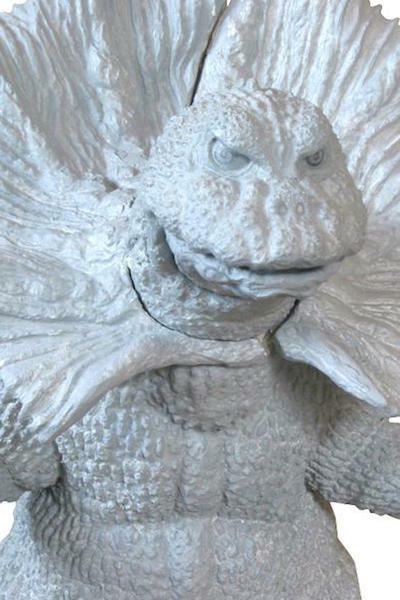 While Billiken's founder, Hayao Hama is renown as an incredible sculptor (handling most the Ultra characters, for example), every iteration of Godzilla he's produced has been a collaboration between them, with Sugo flying solo on such kits as Mechani Kong (King Kong Escapes) and Baragon (Frankenstein Conquers the World). Does this beast from Episode 10 of ULTRAMAN (1966) look familiar? So, who is this frilled, man-made dinosaur, anyhow? 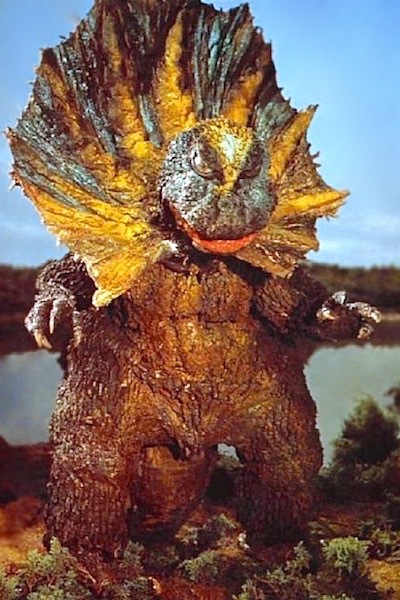 Jirass, while not described in the original teleplay, is a prehistoric monster created by a mad scientist ('natch), the design was inspired by the frilled lizard, Chlamydosaurus. With people joking, "Who would win: Godzilla or Ultraman? ", Executive producer Eiji Tsuburaya, ordered his staff to redress one of the Big G's monster suits. But, it wasn't a simple case of merely sticking new parts any old Godzilla laying around. 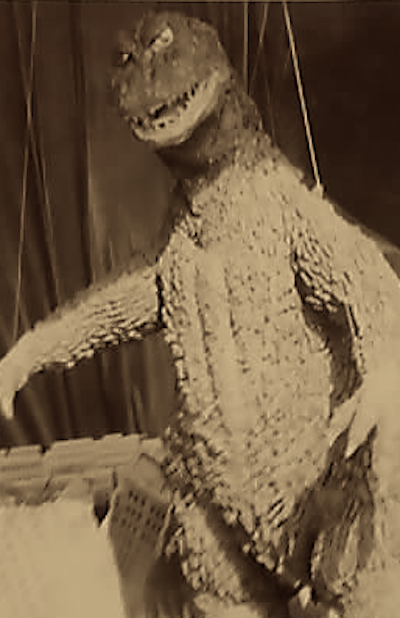 May 1966, a kaiju event was staged at a department store in Tokyo's Ueno Ward, and a Godzilla was needed for a display. Tsuburaya had his team rescue the suit repurposed for Gomess (seen in the first episode of Ultra Q), last employed in GHIDRAH, THE THREE-HEADED MONSTER (originally created for Mothra vs. Godzilla), and restore it. The head was swapped out with the one built for MONSTER ZERO, and modified. When the episode went into production, they added a giant frill, bright colorways, and... Voilà! Here's the formidable, frilled, man-made dinosaur... Jirass! In the episode, "Mystery of the Dinosaur Base" (teleplay by Tetsuo Kinjo and directed by Kazuho Mitsuta), Kinjo's scenario does not outline the details of the fight scenes, which were left up to effects director Koichi Takano, and actors Satoshi "Bin" Furuya (Ultraman) and Haruo Nakajima (Jirass). 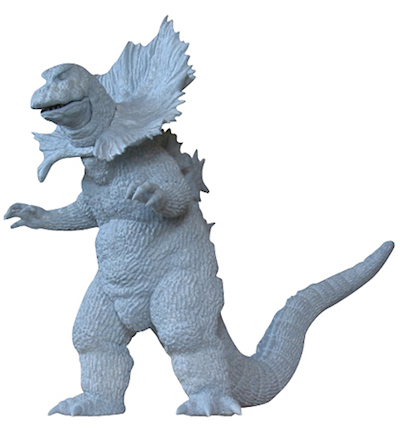 It was then decided to have the silver and red superhero rip the frill from the monster's neck, allowing for a brief — and "unauthorized" — "Godzilla vs. Ultraman" sequence. Left quarter view of the prototype pull of Billiken's Jirass. 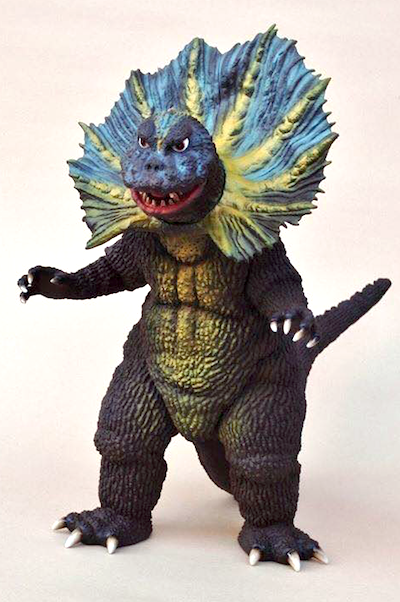 Over the years, Jirass has gone on to become one of the most iconic of the Ultra Monsters, and a number of great garage kits and over-the-counter toys have been made in his likeness from companies such as Falchion, X-Plus, Fewture, Yamanaya, Bandai, and Bullmark. While I stand partial to the dynamic pose of the 25cm version from X-Plus, I believe the Billiken is going to be the beast to beat, towering over 30cm (12") — although it comes unpainted. Rear right quarter view of the prototype pull of Billiken's Jirass. The "Billiken Real Model Kit Series: Jirass" will available for pre-sale to those attending Super Festival 69 in Tokyo on Sunday, September 27th. In-store pre-orders will also be taken that same day, at Billiken Shokai, located in Tokyo's Minato Ward. Over-the-counter sales will be open at Billiken Shokai on Tuesday, September 29th, commencing at Noon (Japan Time). 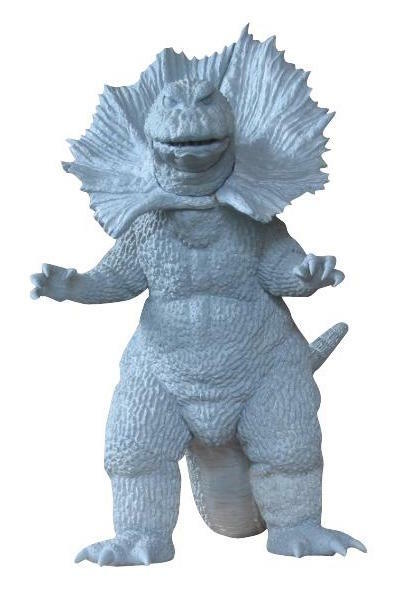 Unassembled and unpainted, and molded in "Billiken Godzilla Blue" vinyl, Jirass retails for ¥6500 ($54.00 USD). The color sample in the top image was painted by Kazuhiko Uchida. Can't wait to get my hands on one! NEXT GODZILLA NOW ENTITLED "SHIN GODZILLA"
Toho Announces Three Principal Cast Members! Hiroki Hasegawa will star as an unspecified "Government Official". Next summer, the first Japanese Godzilla in 12 years will be released, and on September 22nd, the main cast for the contemporary film was announced. The lead star is Hiroki Hasegawa (some mistranslating his given name as "Hiromi"), who will play a "government official" dealing with monster's rampage. The 38 year-old Hasegawa, aka "Hasehiro", has acted on stage, television and film, recently starring as Ryoichi Suzuki in Shion Sono's LOVE & PEACE (2015) and Shikishima in Shinji Higuchi's ATTACK ON TITAN (2015). 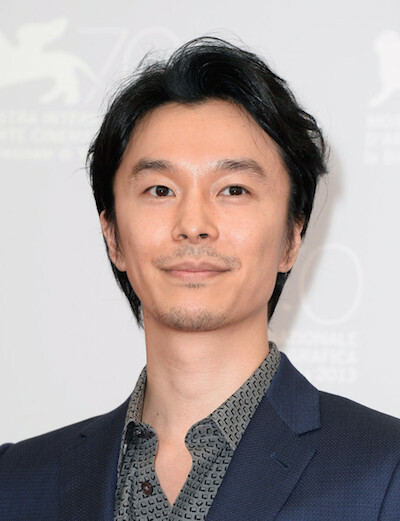 Popular Yutaka Takenouchi will also play a "Government Official". Hasegawa's male co-star is Yutaka Takenouchi, who began his career as a model, and made his acting debut in the television drama, MY FIRST JOB (1994). 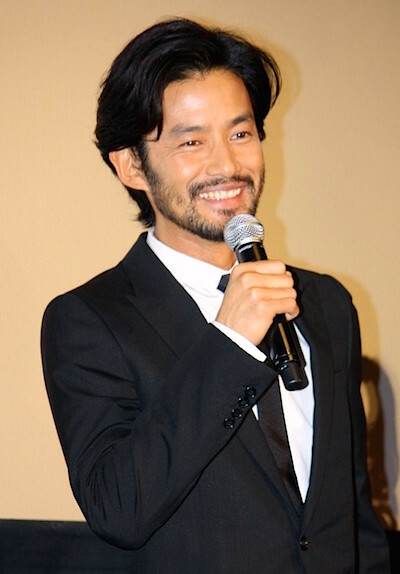 In 2002, the 44 year-old Takenouchi received a Best Actor nomination by the Japanese Academy Awards for Isamu Nakae's CALMI CUORI APPASSIONATI (2001). Also in demand for television and commercials, he recently starred as Captain Sakae Oba in Hideyuki Hirayama's Pacific War saga, OBA: THE LAST SAMURAI (2011), as well as Yukihiko Nishino in Nami Iguchi's THE TALE OF NISHINO (2014). Satomi Ishihara's role was described by Toho as a "U.S. Agent." Winning numerous acting awards, Satomi Ishihara was voted Vogue Japan's Woman of the Year in 2010, ranked as 25th and 32nd by T.C. Candler's Annual Independent Critics List of the 100 Most Beautiful Faces in 2014 and 2013, and received Jewelry World's Best Woman of the Year award in 2015. The 28 year-old model first made her screen debut as Sanju in Toshiro Saiga's HOGI-LALA (2002), under the stage name "Kuniko Ishigami". With numerous television and screen credits, Ishihara recently starred as Kanoe Kumoi in Hideo Tanaka's MONSTERZ (2014) and as Hange in Shinji Higuchi's ATTACK ON TITAN (2015). The official katakana title logo in the style of the 1954 original. While the supporting cast has yet to be revealed by Toho, principal photography has already begun, under the title "シン・ゴジラ" (Shin Gojira), which was announced as official during the press conference on September 22nd. This title has been rendered in katakana, the writing system usually reserved for foreign words — with "Gojira", of course, being "Godzilla" — while "Shin" is a triple-entendre reading of the kanji characters for "新" (new), "真" (true), "神" (god), according to the film's Supervising Director Hideaki Anno, best known to fans throughout the world for NEON GENESIS EVANGELION. Shooting panic scenes in Tokyo's Ota Ward. Photo by Shimpei Kanada. Toho is confident in Hasegawa abilities in being the pillar of SHIN GODZILLA's cast, in representing the best Japan has to offer, to which the actor stated, "It's no exaggeration to say that he's world-famous, so who wouldn't want to be involved in a Godzilla production?" and shouted, "I want to give this role all I've got!" His fellow cast member, Takenouchi declared that after 61 years since the original, this will be the 29th and best of them all, "With a deeper message." While she received the offer over the phone, Ishihara shouted "Alright! ", but now she's feeling the pressure from all of her English dialogue. She admitted, "Sometimes it's so frustrating, I just wanted to cry." What will the new Japanese Godzilla look like? The world awaits! It was previously stated that the Big G appearing in SHIN GODZILLA would be taller than the 108-meter long creature appearing in Gareth Edwards' GODZILLA (2014). Undoubtedly, when this new Godzilla is finally revealed, for the first time in twelve years, he'll garner even far more attention than the human cast. More importantly, what will this new "Shin Godzilla" look like? Are the rumors of his design and designers true? And how will he be brought to life? 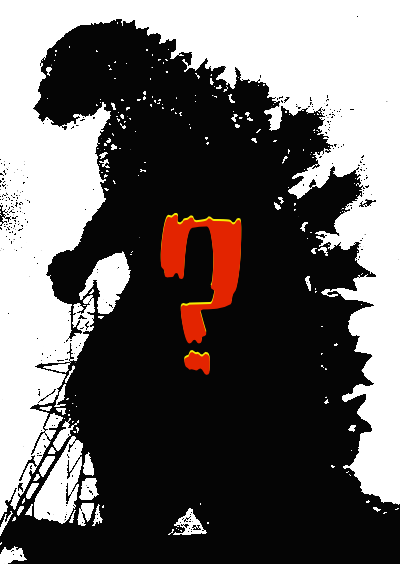 So, stay tuned for more details as it develops, as the true King of the Monsters returns to the screen once again! Based on various Japanese news reports including Sanspo.com and the official "Shin Godzilla" website. The "Bloodthirsty Music" Soundtrack Collection! The "Bloodthirsty Music Collection" CD coming from Cinema-kan. If you're into Japanese cinema and classic horror films, you should be excited by this release. I am. My first exposure to these films were in the pages of Greg Shoemaker's Japanese Fantasy Film Journal. Toho produced three films over four years, directed by Michio Yamamoto, and best described as latter-day Hammer Horrors: Japanese-style. By the late 1970s, I had seen the second and third films at the Kokusai Theater, and Riichiro Manabe's scores were a key element to them. 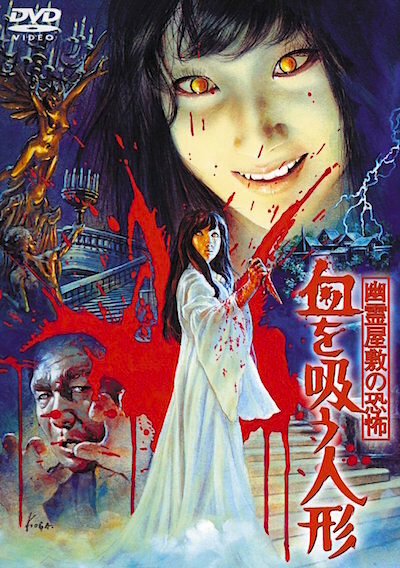 THE BLOODTHIRSTY DOLL (1970) DVD jacket art by Masano Koga. Now, all the soundtracks will be issued in one CD collection! Cinema-kan's press release states: Riichiro Manabe carved his name into the world of horror film history with these everlasting cult works! Now, the first-ever complete compilation of Toho's "Bloodthirsty" Music Collection is finally issued! 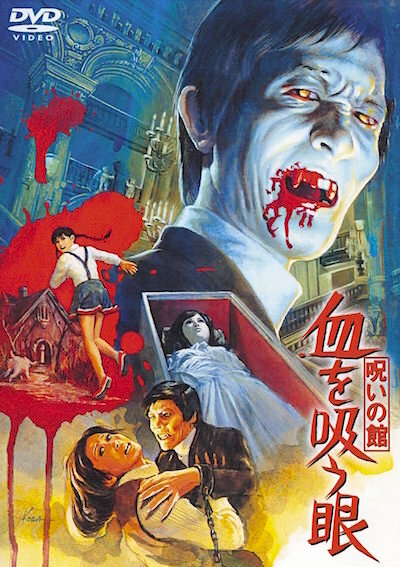 Now, after 45 years, the pinnacle of Japanese vampire films, also known as the "Bloodthirsty" trilogy, receives its first stand-alone soundtrack release! THE BLOODTHIRSTY EYES (1971) DVD jacket art by Masano Koga. This CD-only release includes tracks from THE BLOODTHIRSTY DOLL: TERROR IN THE HAUNTED HOUSE (1970), THE BLOODTHIRSTY EYES: THE CURSED MANSION (1971), and THE BLOODTHIRSTY ROSES (1974), sourced from the original, recently-unearthed 6mm tape masters. This successful remastering of these tracks by Maestro Manabe (Godzilla vs. Hedorah, Cruel Story of Youth) has resurrected the complete scores for all three films. 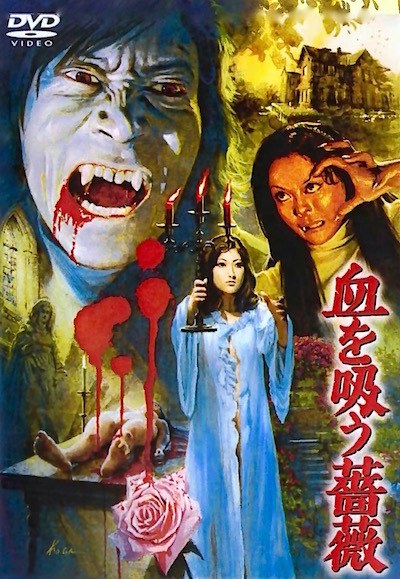 THE BLOODTHIRSTY ROSES (1974) DVD jacket art by Masano Koga. Avant-garde, gothic with a dash of bossa nova?! This is the only music quite like this in Maestro Manabe's world. This premiere release is scheduled to feature over 60 tracks, plus host of bonus tracks to be determined. Bloodthirsty Music: Toho's "Bloodthirsty" Series Music Collection: MSRP ¥2,991 (including tax). Label: Cinema-kan. Catalogue: CINK-7. Mail Order: 006840785. EAN: 4988044020429. Release: November 25, 2015. SHOOTING BEGINS ON TOHO'S "GODZILLA 2016"
Extras Flee For Their Lives In Tokyo's Ota Ward! 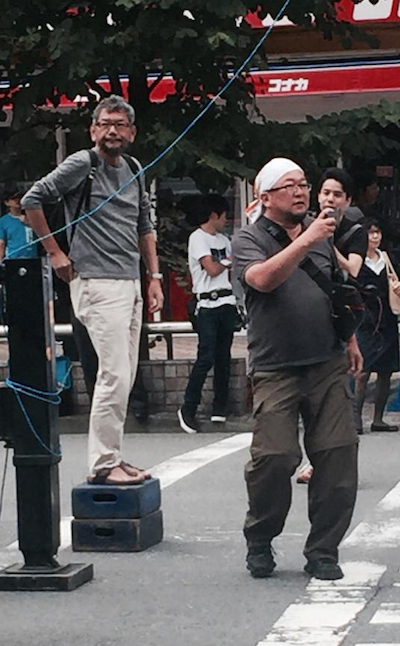 Co-Directors Anno (left) and Higuchi (right) on location in Tokyo. Just a few hours ago, dozens of extras fled from the Big G down the commercial street at Kamata Station's East Exit in Tokyo's Ota Ward, as Toho's first domestic Godzilla film in nearly twelve years finally commences production. Now tentatively titled, "Shin Gojira" (New Godzilla), the film is being co-directed by modern mavericks Hideaki Anno (Neon Genesis Evangelion), who also penned the screenplay, and Shinji Higuchi (Attack on Titan). Already proving to be one of the most highly-anticipated kaiju eiga productions in over a decade (with next to nothing known about the upcoming film's plot, cast, or other particulars), inside sources are saying that this iteration of the world-famous king of the monsters threatens to be "frightening"; harkening back to the original 1954 film, while co-director Higuchi promises, "I'll give you the greatest worst nightmare!" According to this author's sources, "New Godzilla" will premiere in Japanese Cinemas on Saturday, July 23, 2016. * Please stay tuned for confirmation of release date and other details as they develop! *Release date has been confirmed as July 29, 2016.